For example, on a SAP Personas flavor due to the status of an order buttons on the flavor can be enabled or disabled. In this SAP Personas tutorial, I will create a Personas script which is used to disable button whose control id is passed as parameter to the script. Let's first create a script and then call that Personas script with passing control id as a parameter. You will see that the script has an additional Personas id "wnd/scrptPersonas_13"
Please check following SAP Personas script. To pass parameter to this Personas script, developers can use session variables. To read a session variable in SAP Personas script, session.utils.get() method can be used. As you see, I read the session variable pButton2Disable using 'session.utils.get("pButton2Disable")' statement. Just the opposite way of using Get() method of session.utils to read session parameters, developers can use Put() method of session.utils to set session parameter values. Here is the onLoad Personas script which is calling another script and passing parameter to this second Personas script. 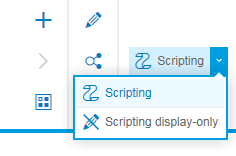 To pass parameters to a script in SAP Personas, you can use session.utils.put method. To execute a Personas script from another Personas script, use session.utils.executeScript method with passing the script id as an input argument.